← Blue Cat ‘Dynamics 4.2′ released with Promo Price ! Valentine’s day has started early. Today you can get an additional 30% off any Waves Bundle or Plug-in that is already on promo. Just use the voucher code ‘LOVE30′ at checkout. Take a look at the listing below to see what you can pick up for a truly unbelievable price until the 14th of February. 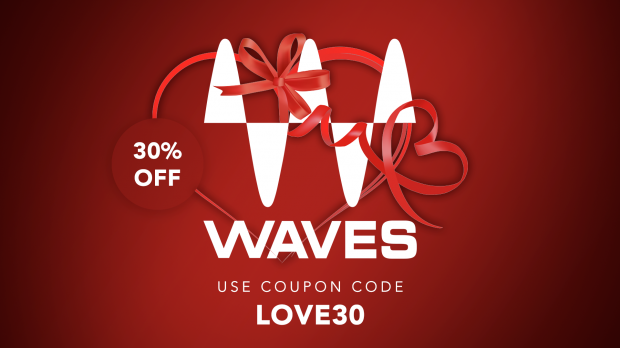 The full Waves product listing with – ‘LOVE30′ DEALS everywhere! This entry was posted in DontCrack, Plug-ins, Promotions, Virtual Instruments and tagged 'LOVE30', Abbey Road Vinyl, Brauer Motion, CLA MixDown, H-Reverb Hybrid Reverb, Horizon, Pianos & Keys, Platinum, Scheps Omni Channel, Smack Attack, SSL 4000 Collection, Vocal, Vocal Rider, Waves, Waves 'LOVE30', Waves Bundle, Waves Plug-ins. Bookmark the permalink.